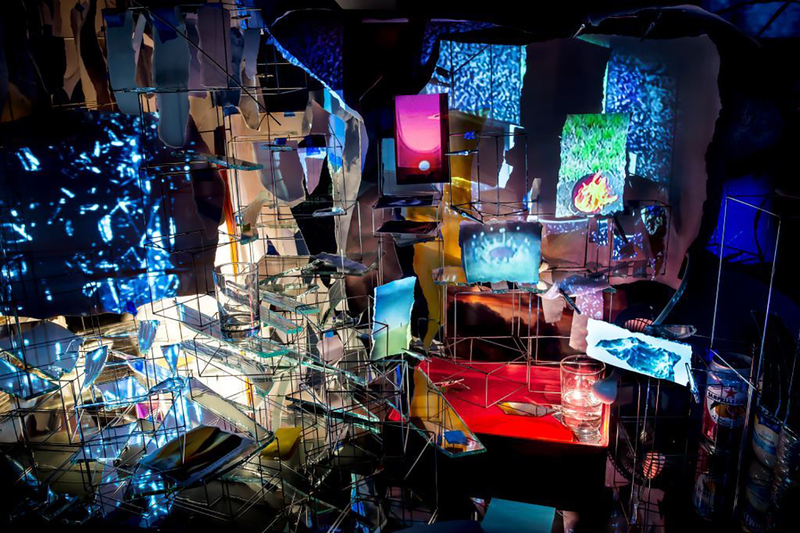 Immersing the spectator in site-specific installations that she herself compares to “studio visits,” both intimate and in flux, US artist Sarah Sze combines intricate systems of objects and images across multiple mediums, from sculpture to painting, drawing, printmaking, and video. On the occasion of her first solo show in an Italian gallery, the artist talks of arranged randomness; balancing craftsmanship and technology; and how Rome and rocks can narrate the experience of time. 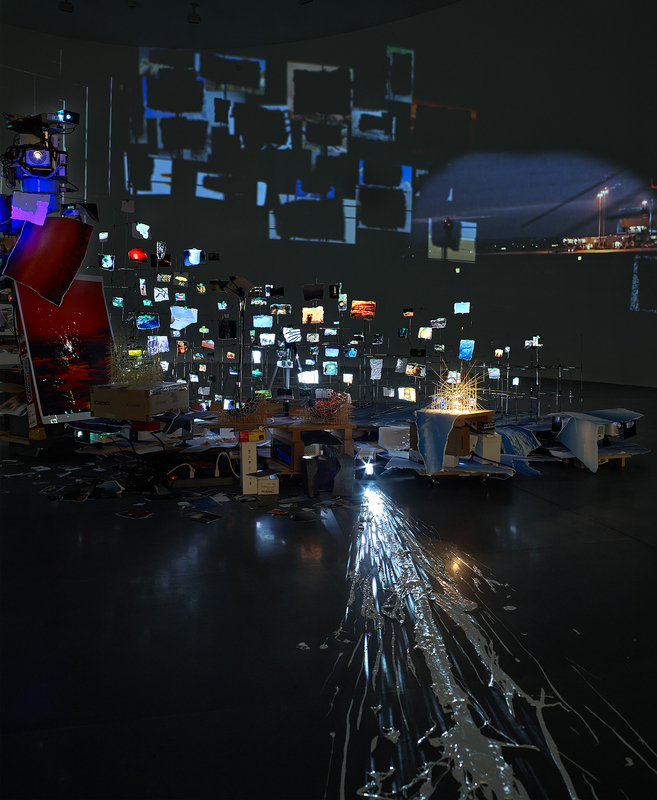 SARAH SZE: Zadie’s description not only taps into the simultaneity that I pursue in my work, but also points to the tactility that I seek to bring to the digital. We can imagine countless videos and images emerging from an exploded iPhone, but what an exploded iPhone would really be is a pile of fragments—glass, computer chips, metal. So this idea of an “iconographic spectrum” is not necessarily opposed to a digital information frenzy, since specific moments, materials, and symbols can be pulled from the chaos of the digital. The art historian George Kubler wrote about how historical time can be thought of as a sea of innumerable forms, and that we navigate this crowded sea using nets of different meshes to capture certain objects or images and bring them into the present. My process is similar: I collect random samples, but they become sort of precious (or even alive) because they’ve been very intentionally arranged. They were chosen from a sea of innumerable forms, picked up by the net or nets that I’ve constructed. And of course you are picking up on some of those nets and the precision in those nets. Some of the ideas behind the collection of images were that they referred to process and materiality (the painting of a bowl, the smashing of a glass), the experience of time and how it can slow down, speed up, or be marked (the landing of a plane, the landscape from a train window), or how a moment might be burned into our memory (a quality of light, a slowed motion). So, to your point that there is choice in the images, these were the precise guiding principles loosely applied to the images, and to the material objects as well. 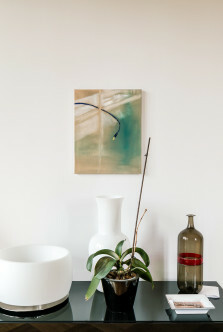 IZ: This meticulous arrangement seems to function through a balance between craftsmanship and technology. How do you see the relation between the two? It seems to suggest a contrast between a precarious force and a more stable one. SS: This a question that I play with often: How to strike a balance between fragility and stability, precariousness and certainty? How to make that both the structure and the subject of the work in an active way? My recent paintings have allowed me to approach this balance in a new manner, as I look to achieve a sense of precarity through meticulous physical processes (layering, tearing, gluing, removing). I use many layers of paper and paint in the paintings, but I want the final surface to feel light, fleeting, even though it is secure. 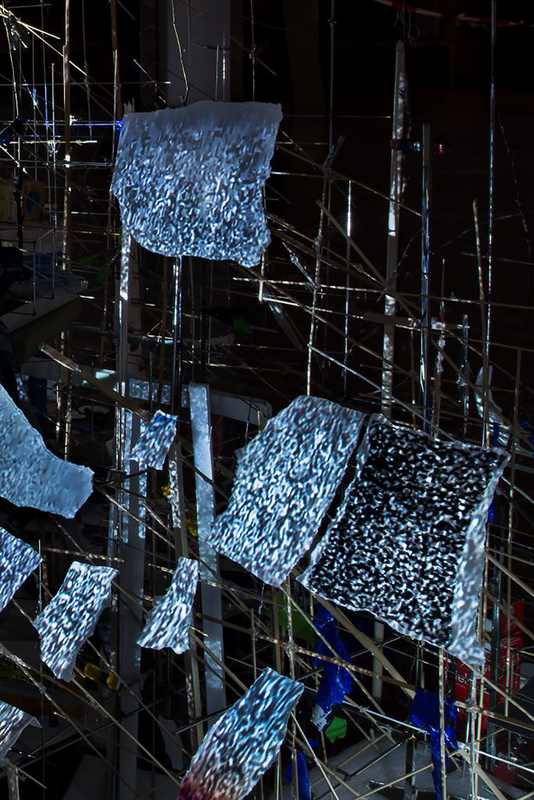 Both handmade “crafts” and technology can communicate fragility and stability all at once, depending on their relationship to each other, their environment, and all of the ideas and perspectives that the viewer brings to them. IZ: Not long ago you preferred to call yourself a sculptor. Can you elaborate on your recent choice to present paintings here? SS: For me, calling myself a sculptor never meant that I was no longer a painter. All of the mediums I use tend to overlap, because each is just a different vehicle for approaching a central set of questions about time and material. Shifts from metal to clay to video to canvas come naturally as I work. Actually, I was originally trained in painting and architecture, but found that sculpture allowed me to break down the separations between mediums. I moved away from both the frame and the pedestal so that the work could become a part of the space and architecture. This often involves a kind of structural transparency, revealing how things are made, how they remain in balance, where they are plugged in. Showing all of that in three dimensions has allowed me to be more emotionally direct in my approaches to painting. There is a sense of freedom in jumping between colors and textures, and showing the first stages of an image alongside the last. 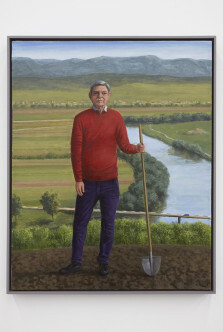 IZ: All the paintings at Gagosian are part of a series called Half-life. May you comment this title? SS: There’s a wonderful film by Charles and Ray Eames, Powers of Ten (1968),that deals with measuring the infinite at both ends of the scale, from the largest to the smallest, and how we try to locate ourselves between the two. This questioning of the measurement of time and scale, and the tools we create to try and quantify time and scale, is in all the work in the show. The half-life of a substance is the amount of time it takes for it to break down by half. Processes of halving and division appear throughout my work. At its most basic level, halving is just a matter of simple division, but it is also a powerful metaphor. It can continue infinitely, breaking whole numbers down into smaller and smaller units, yet never reaching zero. In my paintings, I break down images, dividing and splicing them into a huge number of composite parts. But all of those parts remain within the rectangular confines of the panel. As the composite parts become smaller—tiny pieces of tape or paper, dabs and drips of color—they seem to create the illusion of even deeper worlds or space-times. Infinity is often thought to have a large, expanding scale, but it can also be found in the minutiae. How do you define or measure the time of a life? And a possibly even more absurd question : How to measure the point at which a life is at its half point? Using the term out of scientific context, I think the two words together beg that question, but in the scientific use, “half-life” refers to time it takes for an isotope’s radioactivity to reach half of its original value, and underscores the idea of decay, and what the by-products of the decay might be. 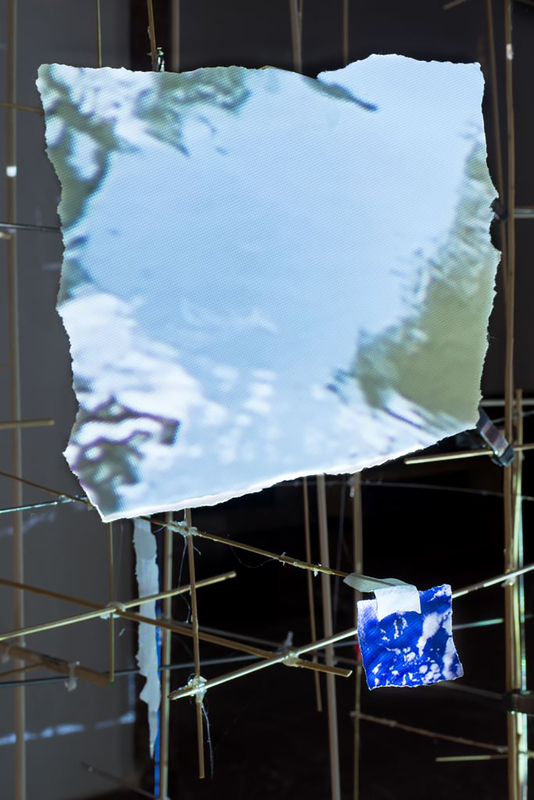 IZ: This idea of measuring human existence brings back to the concepts of process and materiality you were mentioning before: The works in this show seem to develop around strategies of movement. In Flash Point (Timekeeper) in particular, we see many images of birds flying, moving water, airports, constantly in motion through multiple projections. 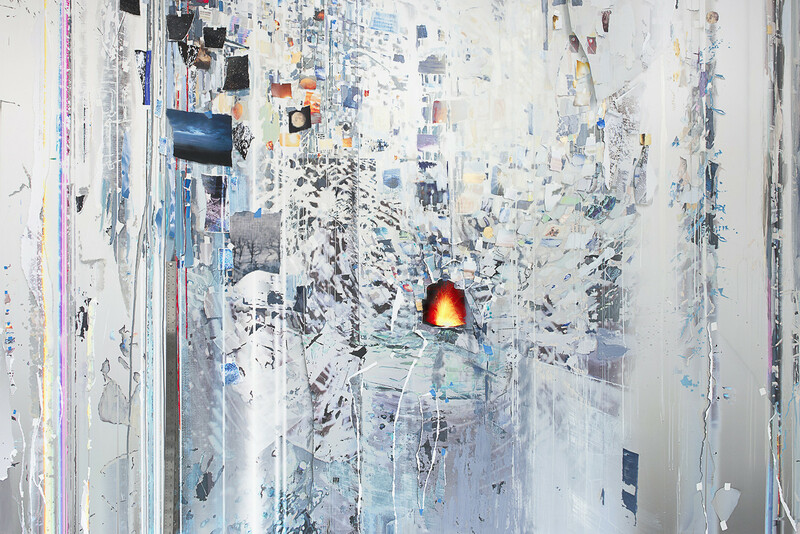 The paintings appear as dynamic overlaps of layers, difficult to fix as a singular image. SS: Like the Italian Futurists and the Russian Constructivists, who were obsessed with the accelerated speed of travel and communications in their time, I think that we, because of technology, are in a period of extreme acceleration in our experience of time and space. Perspective, space, and movement are some of the main catalysts in my work. They allow me to think through the tensions between gravity and weightlessness, sinking and floating, running and walking. 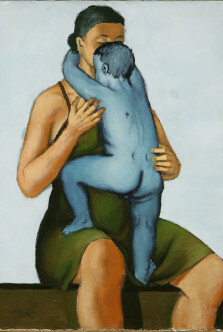 And the relationship between these things is as important in the paintings as it is in the sculptures and videos. 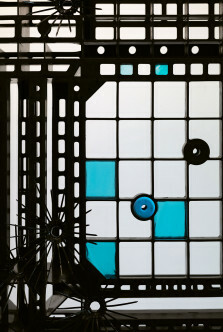 In creating Flash Point (Timekeeper), I had the unique experience of making a work in response to Gagosian’s oval-shaped gallery, which imposes a sense of centrifugal motion on its own. 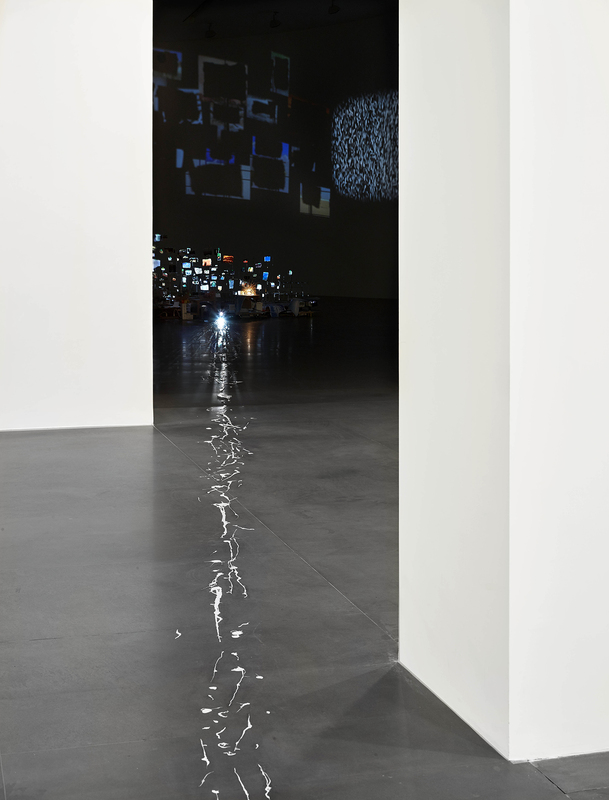 As I installed the projectors and thought about the flickering lights, the circling videos, and the mechanical elements of the work, I had to think about how to react to and even interrupt the circular flow of space and time, rather than simply mimic it. 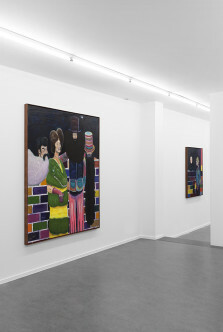 The paintings involve a similar reaction to spatial realities. How could I make images appear to disintegrate and build—to move—even though they are contained within the right-angled shape of the canvas? We don’t really think of images as still anymore. 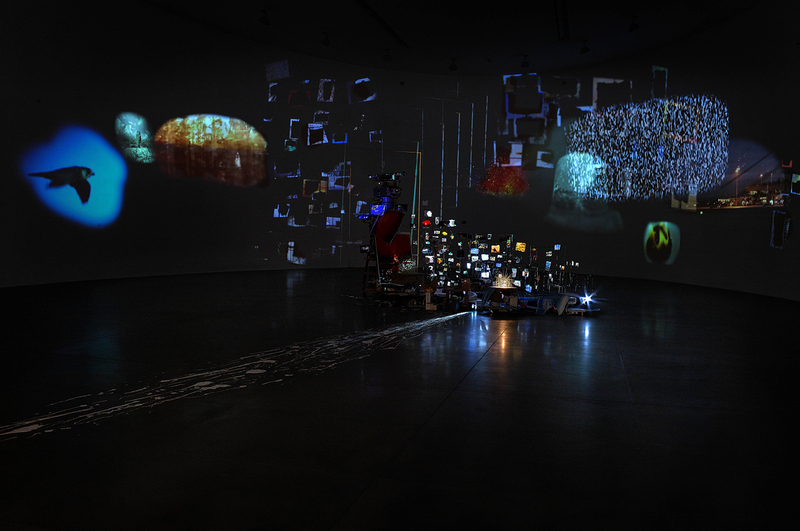 The image is portable, mobile, and active; it has its own choreographies that intersect with and affect our own. IZ: This is your first solo show in an Italian gallery. 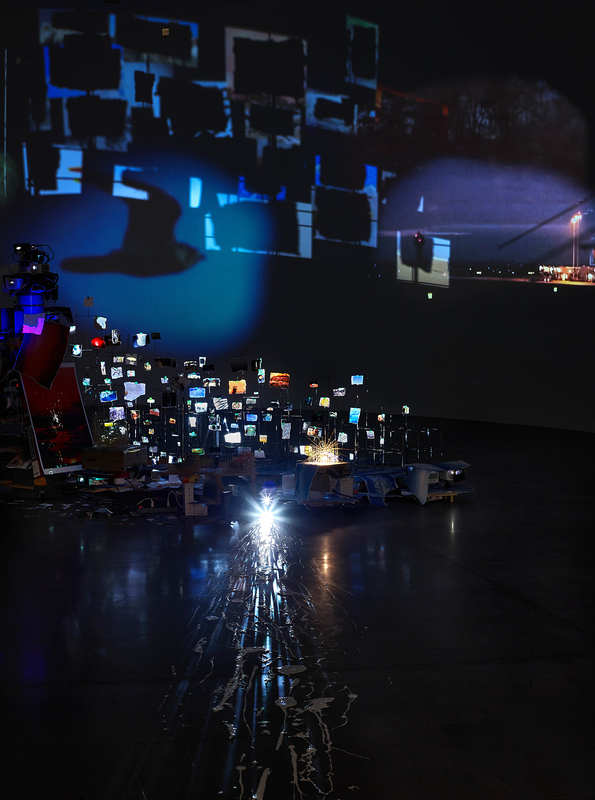 Considering also the reference to the Colosseum in your recent installation Centrifuge, I was wondering if the city of Rome was an inspiration for the show. SS: Absolutely. Rome has history etched into every surface, so the passing of time is so material. 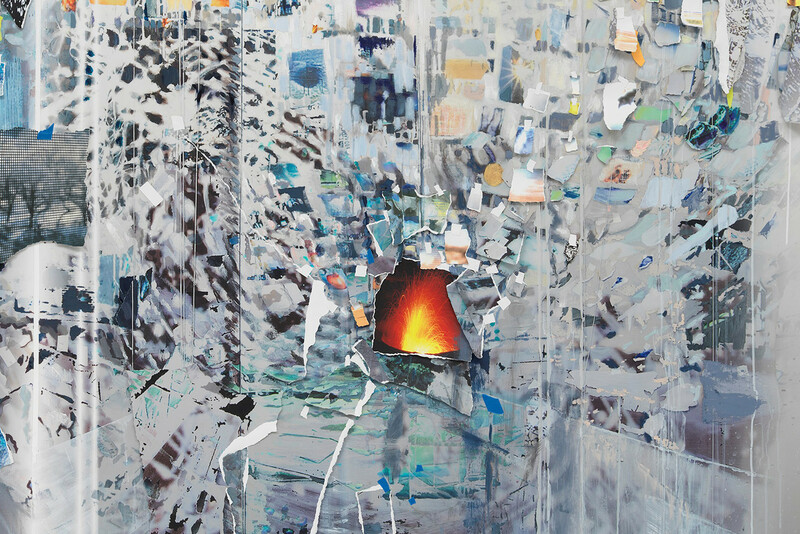 That simultaneity of past and present was very exciting for me to think about, especially for the paintings, which are multivalent surfaces—like city walls revealing fragments of images, layers of civilizations, blurred by weather. And the Colosseum is a great example of an architectural space in which there is no real distinction between performer and performance. Audience becomes stage. Just as the viewer, when walking through the beams of light in Flash Point (Timekeeper), activates and enters the work, in the Colosseum, the actor is a spectator as much as the audience is. You watch the audience as you watch the stage, and you know that you are being watched, too. IZ: What can you tell us about the outdoor stone sculpture you are about to present as part of the Gagosian exhibition? SS: The sculpture is titled Split Stone (7:34) and is the first in a series of similar outdoor stone sculptures I am planning. This one will be on view at Crypta Balbi, a historic excavation site and museum that is part of the Museo Nazionale Romano. To make the work, I sourced a natural granite boulder and had it split perfectly down the middle, creating two flat surfaces. An image of the sunset (that I took on my iPhone at 7:34 p.m.) is embedded into the flat rock surfaces, creating the impression that the rock has split open like a geode to reveal a sky instead of crystals or rock striations. Small circular cavities are carved into the rock surface, and then filled with colored pigment. So it’s a sort of combination of the dot-matrix printing you see in newspaper ads or comics, and more traditional etching techniques, where ink would be embedded into the lines scratched into a copper plate, or a lithograph where the weight of the stone held the image. The sculpture also makes reference to gongshi, natural rocks with interesting or unusual shapes that are traditionally studied and appreciated by Chinese scholars. I’m interested in the idea that rock itself, as a material, can hold messages, memories, and layers of time. 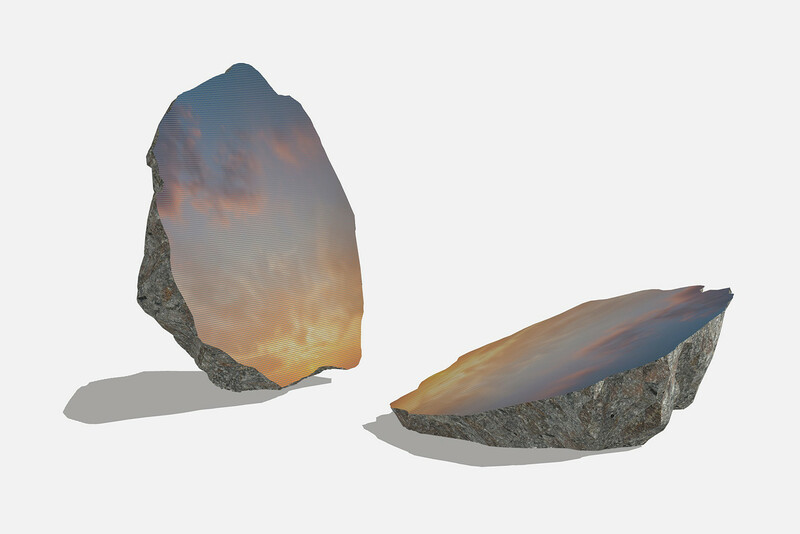 So the sculpture gives a ubiquitous digital image—the sunset—a sense of physical time and gravity, which is underscored by its placement amid the ruins of ancient and medieval Rome.